In this world of mass-created, often poorly made products, it is nice to know that there are still artisans and craftsmen in this world who can create beautiful pieces especially for you. 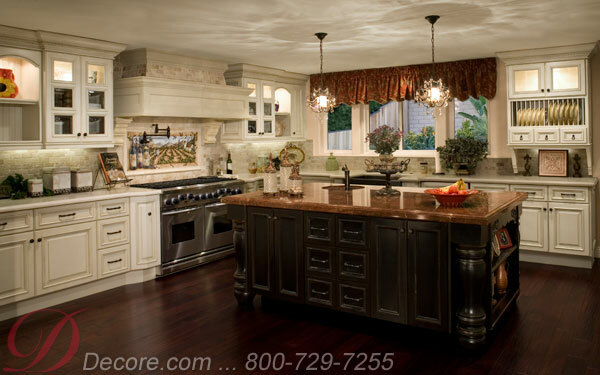 At Decore-ative Specialties, we can custom make cabinet doors for master cabinetmakers to use in their remodeling projects or for homeowners who know exactly what they need and want in their homes. Unfortunately, too many consumers equate the word “custom” with the word “expensive,” which is not always necessarily true. Sadly, in the mistaken belief that they will save money by using stock cabinet doors, these customers won’t even take the time to see how little custom cabinet doors can cost. In truth, custom cabinet doors are competitively priced to the stock models that can be found at home improvement retailers, so it really makes little sense to use a generic product that may not exactly fit the dimensions or appearance of your kitchen or bathroom projects. Ordering custom cabinet doors also opens up your possibilities in terms of the styles and wood species you can use in your remodeling project. If you are interested in, for instance, contemporary high gloss red doors with bullnose corners, you are probably not going to be able to find these doors in your neighborhood home improvement store. Decore-ative Specialties can make these doors, as well as other specialty cabinet doors such as ones fashioned from aluminum with clear glass or mosaic inserts or beautiful ones made from bamboo. The talented craftsmen at Decore-ative Specialties have the skills and the materials available to create custom cabinet doors out of any available wood species and in a number of different styles, including modern, country, traditional, Nantucket, just to name a very few. The design of your kitchen or bathroom remodeling job will never have to be limited by stock cabinet doors. If you are a homeowner, it is important to realize that your new kitchen will be with you for many years. You don’t want to have to tear it up again in a few years because you realized that the stock cabinet doors just never looked quite right. It is always better to do the job right the first time. It is also important not to skimp on the quality of your cabinet doors and drawer boxes, which are visually one of the first things that catch people’s eyes when they walk into a home. Not only will beautiful custom-made cabinet doors enhance the appearance of your home, but they will also hold up better to long-term wear and tear than poorly made stock cabinet doors. Customers also need not worry that custom-made cabinet doors will take too much time to create. Decore-ative Specialties, which is a family-owned company that has been in business since 1965, has five manufacturing facilities located in different parts of the United States. With so many manufacturing facilities, Decore-ative Specialties is easily able to meets its customers’ needs. In addition, many of the company’s skilled craftsmen have been with Decore-ative Specialties for a number of years, and they take great pride in their work and their beautiful custom cabinet doors.